Meet Snuppy, the World's First Cloned Dog South Korean scientists announced Wednesday they have created the first cloned dog. Snuppy, an Afghan hound, was born in April. The cloning technique used is not efficient. It took nearly 2,000 eggs to make some 1,000 embryos -- all of which produced just one healthy puppy. 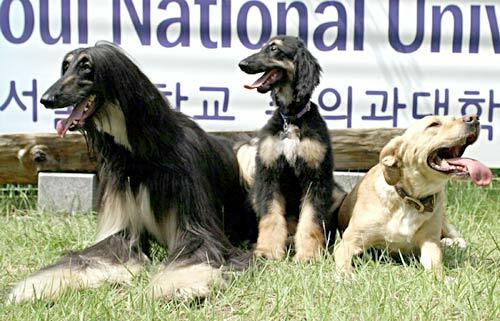 South Korean scientists announced Wednesday they have created the first cloned dog. Snuppy, an Afghan hound, was born in April. The cloning technique used is not efficient. It took nearly 2,000 eggs to make some 1,000 embryos — all of which produced just one healthy puppy. Family Photo: Snuppy stands next to the male Afghan hound (left) from which he was cloned. Snuppy's surrogate mother was a yellow Labrador (seen in enlarged photo). First, there was Snoopy. Now there's Snuppy. Unlike Charlie Brown's beagle, Snuppy is an Afghan hound. Snuppy's claim to fame is that he's a clone, the first cloned dog ever created. NPR's Joe Palca has more. It's been eight years since Dolly, the cloned sheep, started a cloning craze. So far scientists have successfully cloned mice, goats, pigs, rabbits--yes, rabbits--cats, rats, mules and horses. But the dog turned out to be difficult. Three years ago a team of Korean scientists decided to give the dog a try. It's the same team that successfully cloned a human embryo. 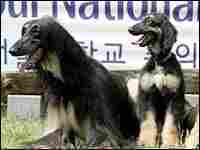 To make the dog clone, the Korean scientists started with skin cells from an adult Afghan hound. They then inserted a skin cell's DNA into a dog egg from which the DNA had been removed. Once the egg starts dividing, you have a cloned embryo. Dr. B.C. Lee of Seoul National University says they used nearly 2,000 eggs to make their cloned embryos. Dr. B.C. LEE (Seoul National University): We make 1,095 cloned embryo and transport to 123 dogs. PALCA: The 123 dogs served as surrogate mothers. As they report in tomorrow's issue of the journal Nature, for all those embryos, the team only got three pregnancies. One fetus miscarried. Two carried to term. One of the puppies died of pneumonia at 22 days, but the other is now three and a half months old and apparently fine. That's the one called Snuppy, named for Seoul National University. Dr. LEE: Seoul National University puppy, S-N-U-P-P-Y. PALCA: (Laughs) I like that. Lee says they chose an Afghan hound to clone because they wanted to make it easy to make sure they really had a clone and not an accidental normal pregnancy. Snuppy's surrogate mother was a golden retriever. And you know when an Afghan hound comes out of a golden retriever, someone is tinkering with Mother Nature. Lee says his team did not undertake its cloning work to help out pet owners anxious to replicate prized animals. Dr. LEE: Absolutely not. We just doing it for the scientific procedure and the scientific knowledge. PALCA: There are several reasons scientists would like to clone dogs. The dog is used in many types of medical research. Duane Kraemer works on animal cloning at Texas A&M University. Kraemer says, for one thing, cloning makes transplant research easier. A pair of cloned animals will have nearly identical immune systems, so transplanted organs and tissue won't be rejected. Mr. DUANE KRAEMER (Texas A&M University): Also, of course, to study the genetic component of diseases, it's nice to have identical animals so that one can determine which genes more readily are responsible for the various traits or diseases that they might have. PALCA: Kraemer and his colleagues nearly took the prize for creating the world's first cloned dog. Mr. KRAEMER: We had produced a pregnancy that went 38 days, and then another one that went to term, but the offspring was stillborn. PALCA: Kraemer's team has abandoned a large-scale program to clone dogs, in part because success proved so difficult. Dogs have a unique physiology that makes their eggs hard to work with. But reproductive scientist Calvin Simerly of the University of Pittsburgh School of Medicine says even though the principles of cloning have been worked out, each species presents its own challenges. Mr. CALVIN SIMERLY (University of Pittsburgh School of Medicine): You have to learn the uniqueness about that model and then design research around those unique properties. So it's just not one size fits all. PALCA: Simerly knows that only too well. He's spent years trying to clone a monkey, so far without success. Joe Palca, NPR News, Washington. NORRIS: You can see a family photo of Snuppy, his dad and surrogate mother at our Web site, npr.org.